Hello and Happy Thursday! Today is a very special day, because I'm joining in my first fashion challenge. Jacquelyn is hosting a 7x7 Outfit Challenge, which basically means you pick 7 pieces of clothes and have to make 7 outfits. Jacq explains it much better in this post. For my color palette, I chose black and grey for my neutrals, and used blue as my color. I incorporated all of these colors with accessories, using a blue and grey necklace, and a blue and black scarf. Unfortunately, both of these are really old, so I had to link up to similar pieces. As far as my clothes, I chose really basic pieces that were easy to mix and match. I had a lot of fun with this challenge and can't wait to do more! This was such a fun challenge to come up with new ways to wear all these pieces! Most of these I wore to work last week, so it made getting dressed a lot more easy and exciting. As you can tell, I got the most wear out of my plaid shirt (which I love!) and didn't wear the grey sweater as much as I thought I would! I do like that it looks good either open or closed, which offers more versatility. I also think that next time I'll include scoop necks instead of v-necks, because I didn't like how the v-necks looked layered under other clothes. Thank you to Jacq for hosting the linkup, and make sure to check out the other submissions! 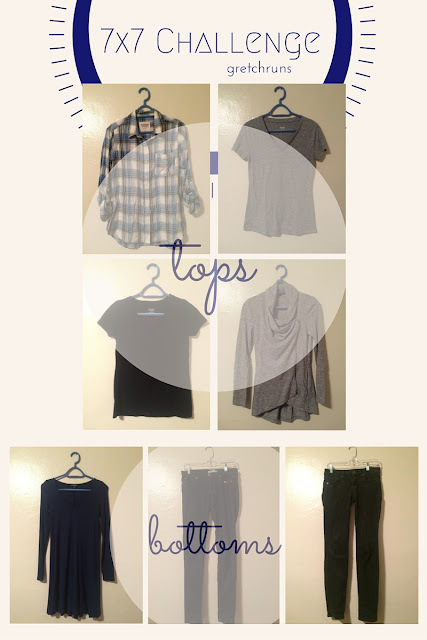 Linking up with Amanda for Thinking Out Loud Thursday as well! If you had to choose 7 pieces of clothes, what would you pick? What is your normal color palette? I think #5 is my favorite; I wouldn't have thought of that combination. I actually wore outfit #7 earlier this week. I've been loving flannel shirts this fall. Me too!! They're so comfortable! So cute and what fun it is to mix and match. Outfit 2 is totally my fave! I usually stick to a lot of black during the work week (because I'm boring) and a more neutral palate the rest of the time! Lots of tans, browns, grey, blacks, and whites. I wear a lot of black as well! It's so easy and always looks good. I really like the jeans and gray t-shirt. I like gray colors they are so easy to blend with others. I do not like bright colors. What a fun challenge. I agree..greys are always my favorite. I only wear brights in the spring and summer, so now it's time for darker colors! This is my first time visiting your blog, but what a fun challenge! I think # 4 is my favorite because it is so classic, but still looks like there was some thought put into it! I usually wear a lot of oatmeal/cream colors with a pop of pink or yellow. My running clothes are all sorts of crazy colors though.. Thanks for stopping by! I'm the same with running clothes...so bright and fun then my regular clothes are boring and neutral. Makes it easy to make outfits though! So cute! I tend to wear the same color pallet! I need to spice things up a bit! Love that grey sweater!!! So cute! Grey tee and jeans! You are so cute. Legs for milezzzzz. You are so nice :) Must be the angle! Very cute! I think the last one may be my fave. I have way too much black in my closet...it's just so convenient and looks great! #4 is my FAVE! love it. this is so fun! i love to do things like this when i'm packing, ie going somewhere fun. work clothes aren't as fun lol. i love that dress! Ooh, love that gray sweater! And the dress is so cute on you.